SLD Pumps and Power has played a key role in the opening and maintenance of a giant leisure facility in North Wales which can provide the longest man-made surfable waves on the planet. 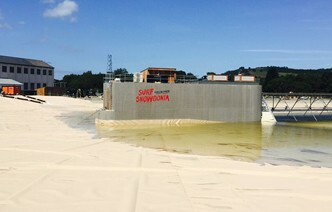 Without the water filling the huge tank in the welsh mountains Surf Snowdonia could not have begun to have the success it is having. Since opening in August this year it has already hosted Red Bull Unleashed, in September, and is proving a hit with the surfing community. This is the largest facility in the world using patented Wavegarden technology. For the first fill two 12” CD300M diesel pumps, on hire with hoses and couplings from SLD, pumped water into the 300 x 110 metre lagoon at 900 cubic metres per hour each. 33,000 cubic metres of water are required for this facility which stretches over the same area as six football pitches. During this development phase of the facility the pumps are also being used for draining and top up and several smaller 4” and 8” pumps have also been hired from SLD for various other tasks. Hoses and couplings have also been sold to the on-site technical team for future use. The initial fill took around 18 hours to complete. The natural rainwater used comes from Llyn Cowlyd, the deepest lake in North Wales, and passes through RWE’s hydroelectric station at Dolgarrog before entering the lagoon. The water is kept clean by UV disinfection and a filtration system so that surfers are not subject to any harsh chemicals or chlorination impact. The SLD pumps were also used to empty the facility to enable the broadcasters’ scaffolding to be erected across the water to provide the exciting tv coverage and filming of the Red Bull Unleashed event.